New to Studio Ninja? Start here! Learn how to create a contact form, embed it on your website and start receiving enquiries. Use this page to create a contact form that you can either embed on your website or we can host it for you. 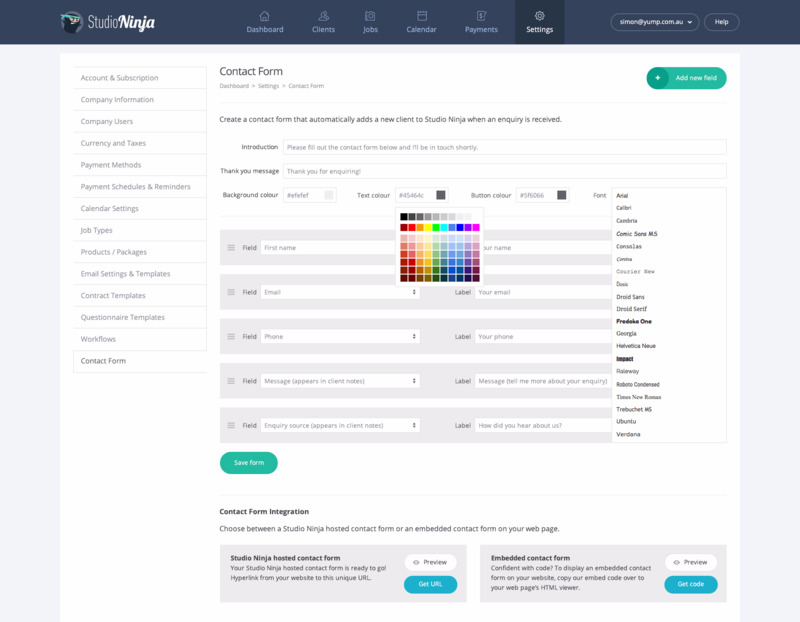 Whenever an enquiry is received through the contact form, a new client is automatically created in Studio Ninja and you will be notified by email with all the details. 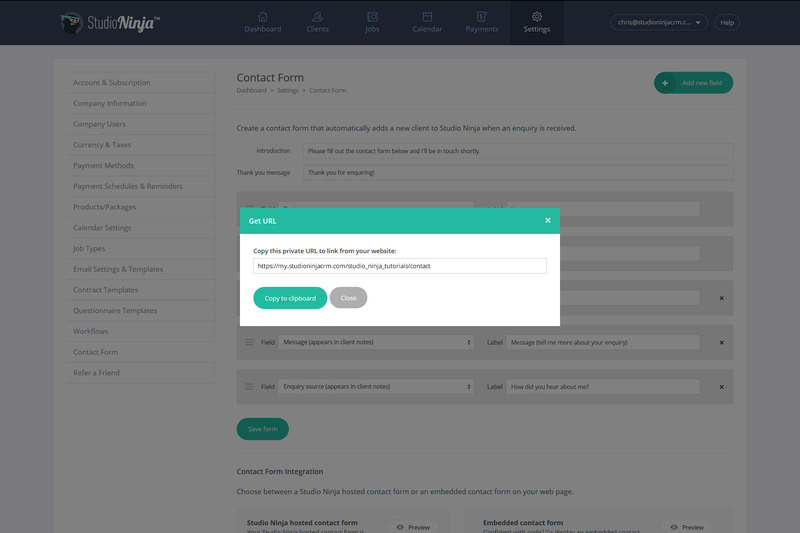 A default contact form has already been setup for you in Studio Ninja to help you get started but feel free to modify it any way you like. The fields 'First name' and 'Email' are both mandatory fields and cannot be deleted from the contact form. The fields 'Last name' and 'Phone' will automatically get copied into the client profile when the contact form is completed. The answers to all the remaining fields get copied straight into the client notes so you have a permanent record of the enquiry for future reference. Step 1 - Add an introduction: appears above the contact form and should invite potential clients to fill in the contact form. Step 2 - Thank you message: appears once the contact form has been successfully completed by your potential client. Step 3 - Fields: choose the fields that you would like to add to your contact form. For example, First name, Email, Phone, Message. Step 4 - Labels: input the label names that you would like to appear on your contact form. For example, the field 'Message' should have a label of 'How can I help you?' or 'Please tell me more about your wedding'. Step 5: when you're happy with everything, click the 'Save form' button. Note: If you've enabled GDPR, you can also add your consent statement here. 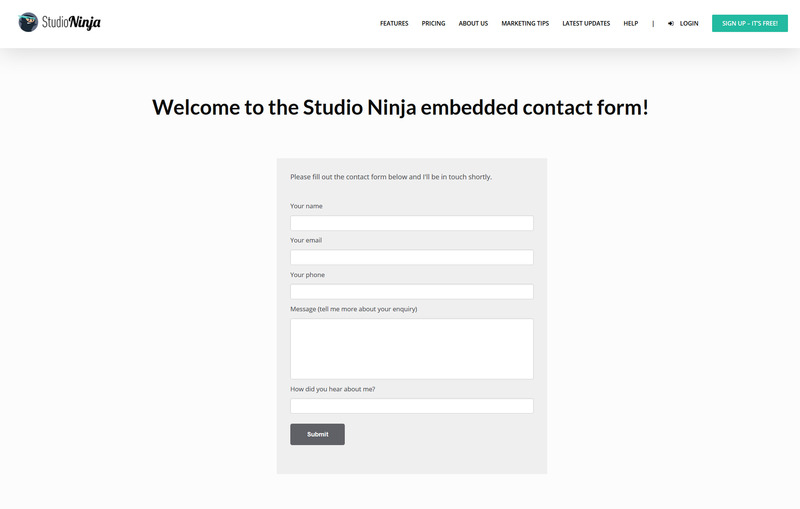 You can integrate the Studio Ninja contact form in two different ways. Choose between a Studio Ninja hosted contact form or an embedded contact form on your web page. To use the Studio Ninja hosted contact form simply click the 'Get URL' button and then copy / paste the link onto your website. You should add this link to your Contact Us button and anywhere else on your website where you would like to link to this contact form. 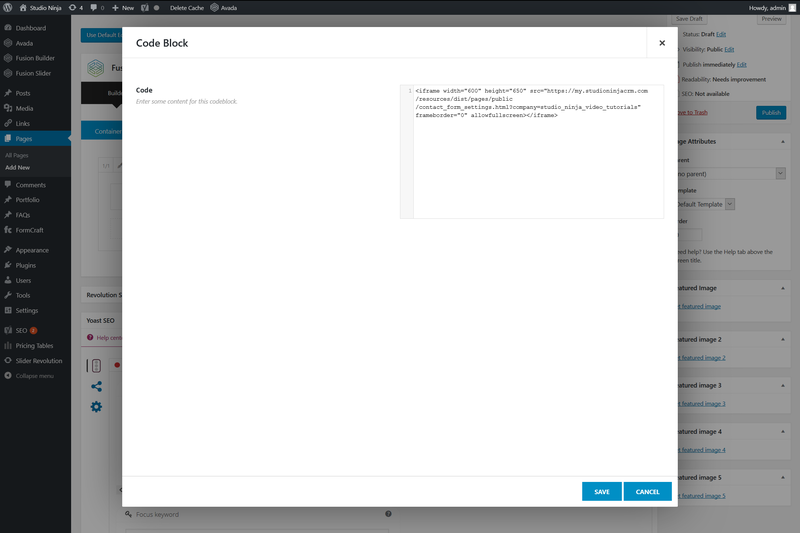 To use the Studio Ninja embedded contact form, simply click on the 'Get Code' button and then copy / paste the iframe code into your website CMS (like Wordpress or Squarespace for example). If you like you can customise the height and width of your contact form by changing the values. These values are measured in pixels, so in the example above, this iframe is 600px wide X 650px high. Currently we don't offer customisation of the contact form design. Once saved, the contact form will appear embedded into your website.